Less than a micrometer thin, bendable and giving all the colors that a regular LED display does, it still needs ten times less energy than a Kindle tablet. Sharing such a description, researchers announce that they have developed the basis for a new electronic "paper". 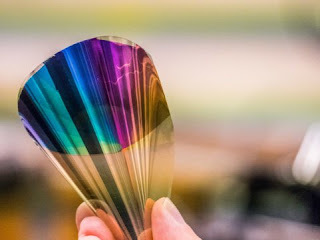 Less than a micrometre thin, bendable and giving all the colours that a regular LED display does, it still needs ten times less energy than a Kindle tablet. Researchers at Chalmers University of Technology have developed the basis for a new electronic "paper." Their results were recently published in the journal Advanced Materials. When Chalmers researcher Andreas Dahlin and his PhD student Kunli Xiong were working on placing conductive polymers on nanostructures, they discovered that the combination would be perfectly suited to creating electronic displays as thin as paper. A year later the results were ready for publication. A material that is less than a micrometre thin, flexible and giving all the colours that a standard LED display does. "The 'paper' is similar to the Kindle tablet," says Andreas Dahlin. "It isn't lit up like a standard display, but rather reflects the external light which illuminates it. Therefore it works very well where there is bright light, such as out in the sun, in contrast to standard LED displays that work best in darkness. At the same time it needs only a tenth of the energy that a Kindle tablet uses, which itself uses much less energy than a tablet LED display." It all depends on the polymers' ability to control how light is absorbed and reflected. The polymers that cover the whole surface lead the electric signals throughout the full display and create images in high resolution. The material is not yet ready for application, but the basis is there. The team has tested and built a few pixels. These use the same red, green and blue (RGB) colours that together can create all the colours in standard LED displays. The results so far have been positive, what remains now is to build pixels that cover an area as large as a display. "We are working at a fundamental level but even so, the step to manufacturing a product out of it shouldn't be too far away. What we need now are engineers."